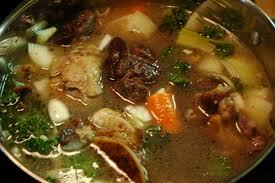 That night you drain the broth and throw away the bones and vegetables, which is to say almost everything. Which seems wrong. Wasteful. But it’s not; you’ve retained the best. Chill the broth overnight. As you sleep, the fat will rise to the top of the pot and can be easily skimmed off the next morning. Now start simmering again. Simmer that liquid so it reduces, reduces, but never disappears. Forty-ish hours into the process (more if you count the grocery store trip), you have a quart of liquid gold. This gives you the base for Classical Girl’s phenomenal New Year’s Eve French onion soup, which will require another two hours on your part to make. Or you can reduce the liquid even further, down to a cup, say, for a sauce that you might combine with some Madeira or cabernet sauvignon, along with butter, shallots and sliced wild mushrooms, to blanket a filet mignon or chicken breast. A distilled masterpiece. One cup of sauce, representing all that work. Was it worth it? Is the flavor that much improved over a more expedient process? 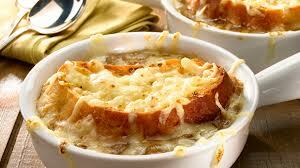 The French onion soup? Ditto. That night you consider everything acquired from the day and you throw most of it away. Which seems wrong. Wasteful. But it’s not; you’ve retained the best. As you sleep, thoughts of bad habits, ungainly passages, a less than economical use of the bow, will rise to the top and can be easily skimmed off the next morning. Now start simmering again. 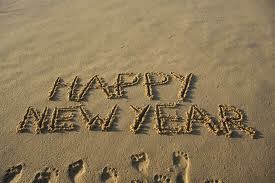 Simmer those musical phrases, thoughts of the composer’s intentions, so they reduce, reduce, but never disappear. Forty-ish days/weeks into the process (more if you count the purchasing trip), you have twenty minutes of aural gold. This gives you the base for a phenomenal violin concerto performance with orchestra, which will require another two years/decades on your part to make happen. Or you can reduce the musical perfection even further, down to a movement, performed in a recital, that you might combine with some Mozart or Bartók. A distilled masterpiece. They’re thinking several weeks’ worth. Months’ worth. How about years, decades? And what they don’t see is what you’ve discarded along the way—much like the bones and limp vegetables that fill my trash after my stock is made. Goodbye the excess fat, the too-sentimental phrasing, the wrong type of vibrato, and in its place is the exquisite, the organic, the ineffable. This small serving of peerless classical musical expression, that is your art, your craft, at its finest. Was it worth it? Is the music that much improved over a more expedient process? 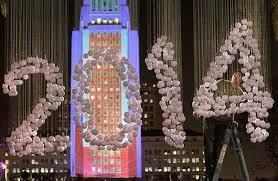 May your 2014 be filled with excellent stock experiences and loving hours devoted to endeavors that nourish you. This entry was posted in Life, The Violin and tagged best soup recipe, learning to play the violin, making beef stock, making French onion soup, New Years Eve meal ideas, taking stock on New Years Eve on December 31, 2013 by admin. Wrote and published this in 2009. It still cracks me up. 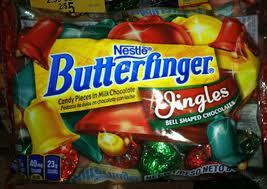 When buying Christmas candy this year, I included a personal favorite of mine, those little bell-shaped chocolates with slivers of Butterfingers mixed in. They’re so festive and seductive in their gold, red and green foil wrappings, I couldn’t resist sampling one (okay, two) before hiding them in the attic that night. The next day, while wrapping Christmas gifts, I felt a hankering for just one more. I unlocked the attic, stumbled among the empty boxes and discarded junk until I found the bag I’d hidden. I shuffled around more, thinking that maybe I’d found last year’s depleted bag, because a bag full of Christmas bells just can’t disappear. But searching produced nothing else. I crumpled the empty bag in my hand, marched downstairs and thrust it at my husband. His blank expression proved his innocence. We mulled over this puzzle and agreed there was no way our son could have gotten into the attic in the past twelve hours, nine of which he’d spent sleeping. We trooped back upstairs and into the attic to further investigate. Five minutes later I found a clue: a few tiny, black pellets, in the white plastic sack the bag of bells had been sitting in. Closer inspection revealed a hole in one corner of the bag, shredded by tiny masticating jaws. 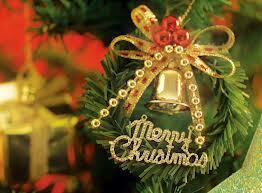 Which means that, in the course of one night, the mice had silently removed the bells, every last one of them. Twenty-two, perhaps. Even faced with such incriminating evidence, no other possible explanation, I could hardly wrap my mind around it. I visualized those mice, a line of busily working creatures, like ants. Did they carry them in their paws while walking? Drag them behind them? Create some little sleigh-like transporting device? I felt like an unwitting character in a Nutcracker production, the oblivious adult who sleeps while the mice, having sprung to giant proportions, wage noisy war against those guarding the house (the stuffed animals? the cats? Lego toy soldiers?). The mice won. Big time. I should be sort of creeped out. We’ve heard mice in the house before, scratching around. We’ve trapped them (humanely, I promise) and released them far from our house. But that was a year ago. No noises since then. These bell-stealers we definitely have not heard. Even now, fortified by chocolate, they are not making any noise as they move about in the attic, the eaves, the house’s invisible nooks and crannies. I imagine those mice right now, huddled silently around this towering pile of gold, red and green bells, staring awestruck at this enormous treasure that will sustain them for a long time to come. A Christmas gift they hadn’t expected, one I certainly hadn’t planned to give. Darned if it doesn’t give me that warm Christmas feeling. 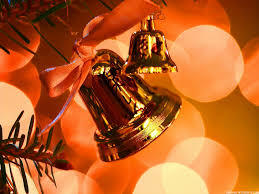 This entry was posted in Life and tagged bell shaped chocolates for Christmas, Butterfingers, Christmas bells, Funny Christmas story, funny story about mice, mice eating chocolate, story about mice in the attic on December 24, 2013 by admin. San Francisco Ballet time again! Watching the San Francisco Ballet perform Nutcracker is a big deal for two reasons. First, because the company does a bang-up, never-seen-it-done-better job on the production. Second, it gives SFB patrons a chance to see what the company is shaping up to look like for their upcoming winter/spring repertoire season. Rosters change, dancers come and go, and we haven’t seen our SFB dancers performing since they closed their 2013 season last May. It’s a long time to wait. As the lights dimmed on Nutcracker opening night at the War Memorial Opera House and the jaunty Tchaikovsky overture commenced, I thought, dang. It’s good to be back here. The December 11th performance was as great as I’d hoped. You can find my review of it here, at Bachtrack. http://us.bachtrack.com/review-dec-2013-sfballet-nutcracker-san-francisco?destination=%2Finstrument%2Fchoreography The performance run will continue through December 29th. If you’re even pondering the possibility of squeezing it in, go for it. It’s a holiday classic, and a classic that started right here for U.S. audiences, on this very stage, on Christmas Eve day, 1944. (Russia gets credit for the 1892 premier.) Yet another third reason it’s thrilling to watch San Francisco Ballet. Julia Rowe and Grace Shibley, from Oregon Ballet Theatre (precipitated, perhaps, by the resignation of Christopher Stowell as artistic director in late 2012? ), joining the corps de ballet. Further new additions to the corps de ballet roster include Isabella DeVivo and Esteban Hernandez. Alexandra Meyer-Lorey has returned after a year’s absence; Nicole Ciapponi was off the company roster in July 2013 and back on in August—yay! The following former apprentices have been promoted to the corps de ballet: Lacey Escabar, Lauren Parrott, Alexander Reneff-Olson, Emma Rubinowitz, and Wei Wang. Five new apprentices have joined the company: Liana Carpio, Aaron Renteria, Miranda Silveira, Mingxuan Wang and Max Cauthorn. The latter, Cauthorn, already looks like he’s being put to good use, dancing his way favorably through Nutcracker as one of the Russian dance trio, and as Madame du Cirque’s (AKA Mother Ginger) dancing bear. New corps dancer Esteban Hernandez joined him in the Russian dance, along with soloist Hansuke Yamamoto, for a strong opening night performance with great ensemble work between the three, which I loved watching (did you read my review yet? Because I mention it there. So go read it). Also on Nutcracker opening night I was pleased to see corps de ballet dancers Kristina Lind and Marie-Claire D’Lyse getting some quality stage time alongside soloist Jennifer Stahl in the French dance trio. Lind and D’Lyse also got later shots at a principal role, cast as the role of Queen of the Snow on Saturday Dec 14th and Wednesday December 18th respectively (matinee performances). New corps de ballet dancer Julia Rowe performed as the Sugar Plum Fairy on Tuesday, Dec 17’s matinee performance. (At Oregon Ballet Theatre, she was a soloist with experience in principal roles as well.) Which all means that Helgi Tomasson has a very strong group of corps dancers this year, and oh, what a fun 2014 season it’s going to be to watch, seeing what he does with all this talent. As for Mathilde Froustey, oh wow, check out this rehearsal footage of her. I think she is going to be a very exciting addition to the SFB principal line-up. In short, get thee ready, San Francisco Ballet patrons. 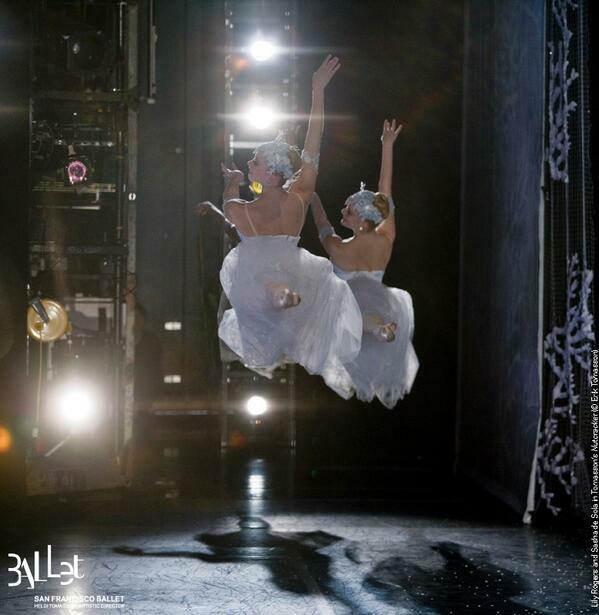 We’re in for an exciting 2014 season, which will commence on Saturday, January 25 with Giselle. 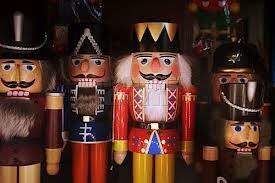 And that Nutcracker thing? Still ten days to go. Get thee over there, too. This entry was posted in Ballet and tagged Aaron Renteria, Alexander Reneff-Olson, Alexandra Meyer-Lorey, Bachtrack, Ballet Alert, Emma Rubinowitz, Esteban Hernandez., Grace Shibley, Hansuke Yamamoto, Helgi Tomasson, Isabella DeVivo, Jennifer Stahl, Julia Rowe, Kristina Lind, Lacey Escabar, Lauren Parrott, Liana Carpio, Marie-Claire D'Lyse, Mathilde Froustey, Matilde Frousty, Max Cauthorn, Mingxuan Wang, Miranda Silveira, Nicole Ciapponi, Nutcracker, San Francisco Ballet, San Francisco Ballet 2014 roster, San Francisco Ballet 2014 season, Simone Messmer, Terez Rose reviewing Nutcracker, Wei Wang on December 20, 2013 by admin. December, the “season of cheer,” never fails to evoke ambivalent feelings in me. Yes, there are the twinkling lights and ringing of bells; crimson and gold decorations adorning shops; the intoxicating whiffs of Christmas wreaths and kitchens redolent of freshly-baked cookies. But December is also the season of great darkness. We have the more obvious factors: a decrease in daylight hours; cold, grey weather; trees stripped of their leaves that now lie in sodden brown heaps on the ground. There’s the stress of an overly social calendar, the frenzied short-tempered crowds in department stores blasted to 78 degrees, the endless media assault of noisy advertisements that test even the cheeriest of souls. Sadly, for me, the latter December has overcome the former, and with each passing year of my adult life, I find myself left with a “just get through it” attitude toward the season. The Grinch who stole Christmas? Moi? Guilty as charged. Now in the year 2005, there’s a new variable: I’m learning to play the violin. (Okay so I’m forty-three and you’re supposed to do this when you are five or six, but I’ve always been a little slow to catch on to what it is I’m supposed to be doing.) As I’d been warned, the craft of violin playing is a challenge. But, like most endeavors in life, if you focus on the journey instead of the destination, you find a lot of pleasure along the way. Like the other night, when I was fiddling around (now recognizing where that term came from) and I began to play an old German Christmas carol. It flowed right out, embedded in my head and heart from childhood Christmas seasons, year after year spent listening to the same treasured (and scratchy) recordings. The sense of well-being that filled me as I played the tune on my violin stunned me, a golden ray of Technicolor piercing the grey of my spiritual torpor. Christmas Eve in the Catholic household I grew up in was a sacred night. Granted, as a child, this was due in no small part to the mountain of gifts accumulating under the tinseled tree and the knowledge that one-tenth of them were mine. But even in later years, when the anticipation of opening presents was replaced with hormones and the anticipation of a glass of champagne or a kiss, it was a night of magic. The moment before I went to bed, I’d stand in the perfect silence of the dark room, lit only by the Christmas tree lights, and feel the spirit of the night swirl around me. Why does magic grow so inaccessible to us as adults? Life nudges us away from it, exposing our childhood dreams and treasured precepts as the naïve illusions they’d always been. There is no Santa. There are no such things as fairies and spirits. 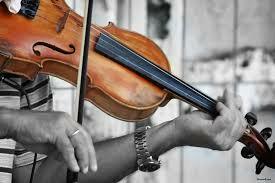 How then to explain, as I played my violin, the magic sweeping over me like the embrace of a divine spirit? In that moment, I had it all back—the peace, joy and timeless sense of security of my youthful Christmas Eves. I look down at my violin now, its sleek, curvy shape, honey-gold wood and smooth varnished surface. The horsehair gliding across the four taut strings produces a sound eerily close to that of a human voice. Better, even. Because since there are no words, there are no misunderstandings, no stories to fight over, no dogma or precepts that will, invariably, cast us into bitter conflict with those who disagree. And there will always be those who disagree. That is the human condition. But these dour, contentious thoughts are easily bypassed when I pick up my violin. The lowest string sounds rich and deep, the musical equivalent of a bar of Swiss chocolate. The highest string is exquisitely sweet—silvery and ethereal. Playing the carol of my childhood, I revel in this new experience that allows me to celebrate, honor the spirit of the season and the return of the light in the purest way possible. Spirituality rediscovered, in a place I’d least expected it. Bye, bye Grinch, you’ve lost your power. Now get out of here and let me play my violin. 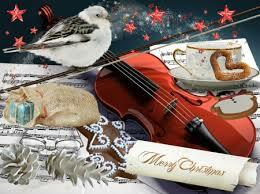 This entry was posted in Life, The Violin and tagged Christmas, christmas carols, December, Grinch who stole christmas, playing Christmas carols on the violin as a beginner, playing the violin, Violin on December 11, 2013 by admin. A small aluminum device for cracking nuts. A little painted wooden soldier with a dislocating jaw that performs aforementioned task. An 1892 ballet originally choreographed by Marius Petipa (and Lev Ivanov), first performed in the U.S. by the San Francisco Ballet on Christmas Eve in 1944, now a holiday tradition throughout the world, particularly in American ballet companies (not to mention a huge money-maker for every company that performs it). The accompanying symphonic work in its full form. Not to be confused with “The Nutcracker Suite,” which includes only excerpts from the full score. It really annoys dancers when you refer to the ballet as the Nutcracker Suite. It isn’t. So don’t. I suggest you click on the embed below ( https://www.youtube.com/watch?v=7U_gpW1J4LM), an audio recording of the whole score (except where the orchestra cut out a handful of counts, around 21m, and don’t ask me why) and listen to the music as you read. A cup of egg nog in your hand, or some hot mulled wine, might make it even more fun. Be my guest. Let’s get this holiday party started. First let’s talk about the ballet. You know the story, right? Certainly, if you’re a ballet peep (in which case you might have gotten as eye-rolling tired of it as I have). But for the benefit of my readers who aren’t ballet peeps, I’ll summarize. In a nutshell, if you will. 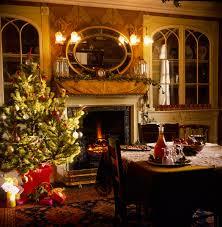 Set during a 1890’s European family’s celebration of Christmas Eve, with family, guests and gifts. For Clara, the daughter, a mysterious-looking nutcracker from everyone’s favorite guest, the equally mysterious and, well, maybe a little whacked out, Herr Drosselmeyer. She’s charmed with the nutcracker, little brother is jealous, a scuffle for it results in Nut getting broken. A real buzz-kill. Party ends shortly thereafter. Post-party, Clara hangs with the now bandaged Nut, falling asleep on the couch with it. Here, things get psychedelic. Family Christmas tree in the corner grows 20x its size, oversized mice scurry in. Nut comes to life, leaping up for battle. Calls out for his soldier minions to join him. Clara’s family’s living room has now become a battlefield. Just when the evil Mouse King is about to do in the Nut, Clara hurls a shoe, killing Mouse King. With that, an evil spell breaks, transforming Nut into a prince. In gratitude, he takes Clara to his kingdom in The Land of Sweets, where various candied characters come out and dance for them. It’s vivid, colorful. The music is sprightly and all are happy. Certainly that’s what the audience is feeling, and since its U.S. 1944 inception, it’s become a much-loved ballet and holiday ritual. But in 1892, audience members regarded each other afterward in a mix of bafflement and horror. WTF? they were probably asking. This was the venerable Tchaikovsky? He of Sleeping Beauty and Swan Lake? This sugar-coated musical concoction? A rough way to work. Tchaikovsky’s first efforts bored even him. And made him sort of panic. Tchaikovsky had suffered from depression all his life, and this point was no exception. News of his beloved sister’s death midway through his efforts on Nutcracker sent him tumbling deeper into melancholy and despair. But, as is so often the case of the creative artist, to the public’s benefit, from that grief-stricken place, Tchaikovsky composed some of the score’s most beautiful music, that made it so much more than a sugar-coated accompaniment to the dancing. You can hear it in the music, those ethereal places where so much nuance and intensity rise up, it gives you the chills. 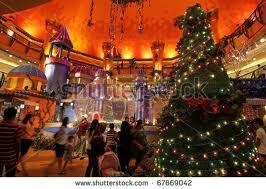 Listen from 19m to about 21m, the scene where the Christmas tree grows to gigantic proportion. Great dramatic intensity. Also at 24m, when Clara has killed the Mouse King, and she’s traveling with the Nut Prince through the Land of Snow. Puts a lump in my throat. (Dancing the role of the Snow Queen, by the way, was my favorite role of my Nutcracker performances. Less stress than the previous year’s Sugar Plum Fairy, and oh, that music. So beautiful. 25 years later, I’m still loving it.) Listen until to 27m30. Sigh… And listen to all of “Waltz of the Flowers,” which commences at 56m. Will never tire of that one. There are so many performance of the ballet on Youtube, I’ll let you pick and choose. In the meantime, my friend sent me this version of “Dance of the Sugar Plum Fairy” that simply can’t be beat. Thank you, Kodi the cat. You are a prima ballerina extraordinaire. This entry was posted in Ballet, Classical Music and tagged Clara and the Nutcracker prince, ETA Hoffman The Nutcracker and the Mouse King, Kodi the cat dances to Nutcracker, Nutcracker ballet, San Francisco Ballet first Nutcracker performance in the U.S., Tchaikovsky, The story of The Nutcracker on December 5, 2013 by admin.